A healthy ocean means a healthy planet. Trump doesn't seem to care. 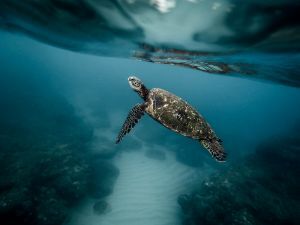 Last week, world leaders, researchers, and advocates of ocean health gathered in Mexico for the fifth annual World Ocean Summit. But one global presence was noticeably absent: No United States government representatives attended the summit, either in person or via teleconference. In contrast, the presidents of Iceland and Norway, the former president of Costa Rica, and officials from Canada, Portugal, Uruguay, the United Arab Emirates, Indonesia, Ecuador, Sweden, Thailand, and Chile were listed as speakers for the three-day event. A U.S. State Department travel ban for the area may have prevented government officials from traveling to Playa del Carmen. Yet the ban doesn’t explain the country’s lack of virtual presence, even while U.S. university researchers and companies were present. Rather, the move seems to reflect the stance of the current administration, which has largely de-prioritized climate and environmental science. The U.S. already has the extensive financial and academic resources to support marine and climate science research — after all, the county’s (often government-supported) research up to this point has played a major role in scientific understanding of our planet. But the U.S. is also the biggest carbon polluter in history, and currently the second largest in the world. Since entering office, the Trump administration has pulled the United States out of the Paris climate agreement, removed climate change from government websites, and shifted the country’s energy industry away from renewable resources and back towards greenhouse gas-emitting fossil fuels. Most recently, Trump opened up US waters to offshore oil drilling, and even considered shrinking or removing 11 marine sanctuaries to do so. Many believe the president is already putting the planet’s future at risk by neglecting to take action on climate change. But ignoring the oceans could have a much bigger impact than Trump may realize. The ocean naturally moderates the planet’s climate by storing both heat and carbon dioxide; according to NASA, more heat is stored in the upper 3 meters (10 feet) of ocean water than the entire atmosphere. Without this storage capacity, the atmosphere would be a full 20 degrees Celsius (32 degrees Fahrenheit) warmer than it already is — making life on land difficult, if not impossible, in many places on Earth. Yet a warmer ocean also means more water vapor and energy fill the atmosphere, making storms stronger and less predictable. It makes for oceans that are inhospitable for ocean life, leaving humans with less to eat and even potentially driving food chains to catastrophic collapse. Of course, the United States isn’t the only country that can provide global leadership on ocean health. As Oceans Deeply notes, the “void” that the U.S. has left is already being filled by other countries; the Canadian environment minister stressed at the World Oceans Summit that Canada will use its role as leader of the Group of Seven (G7) in 2018 to put ocean issues at the forefront. Because the United States has contributed so much knowledge to our understanding of the planet — and so much pollution to it, too — the nation should be more involved. One would hope that, for one of the most decisive issues of our time, the “leader of the free world” would step up, not abdicate responsibility. Cape Town Has More Time to Solve Its Water Crisis. How Will It Use It?